Have you come to believe in Jesus? How deep is that faith? And why do you believe? Are you ready and willing to hold on to that faith no matter what comes your way? Are you ready to follow Him even if it’s difficult and unpopular? Are you ready to suffer as a result of your faith? These are important questions. They are questions that we must answer both when it’s easy to be a Christian as well as when it’s hard. It’s easy to be a Christian and to follow Jesus when everyone else is doing it. For example, at a baptism or wedding it’s normal to want to belong and to let others know of our support and belief in what they are doing. But what about those moments when your faith is ridiculed or put down? Or when you have to make the difficult choice to turn from cultural pressures and stand out for your faith? These are more challenging times to be a follower of Christ. 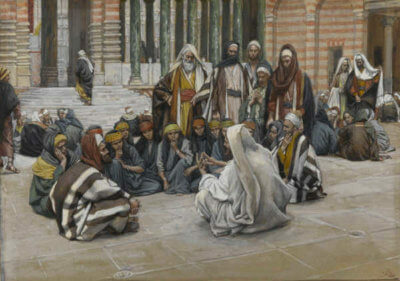 In today’s Gospel there were many who had been analyzing Jesus’ teaching, listening to Him and talking about Him. It seems clear that the consensus was that Jesus was a man of holiness and a great prophet. Many were even coming to believe He was the Messiah. So there was a sort of positive momentum present that made it easier for many people to say that they believed in Him and they believed that He came from God. Jesus quickly points out to them that, though they believe now, there will be a time that comes soon when most everyone will abandon Him, when they are scattered, and they will leave Him alone. This is obviously a prophesy of His coming persecution and Crucifixion. One of the greatest tests of our faith is to look at how faithful we are when following Christ is not all that popular. It is in these moments, more than the easy moments, that we have an opportunity to manifest our faith and deepen our resolve to be a Christian. Reflect, today, on how deep your commitment to Christ goes. Are you ready to follow Him to the Cross? Are you willing to give up everything to Follow Him? Hopefully the answer is a definitive yes. It must be a “Yes” that directs our lives no matter the situation of life we find ourselves in. Lord, I do believe. Help me to let that faith in You stay strong at all times. Help me to say yes to You and to live that yes always. Jesus, I trust in You.